Extensively used in various types of industries, the industrial machines like Industrial Screw Conveyor offered by us are of high quality. These are manufactured with the components of high quality that are acquired from trusted vendors of the market. Our range of industrial machines are acknowledged for their efficiency and reliability. 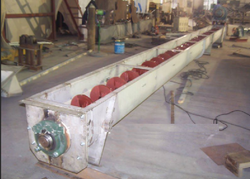 The Screw conveyors are used to transfer granulates, powder type material from one location to another, in vertical, horizontal or inclined position. The equipment can be manufactured in various ferrous, non-ferrous material as per customer requirements. The equipment can be manufactured in various ferrous, non–ferrous material as per customer requirements.